Got this in the mail the other day from Eric who is in Kid Icarus and runs Summersteps records. Nice Star Trek sleeve, I actually has a bunch of Star Trek 45's that were little comics and they had a record in the back. When you heard a chime you had to turn the page. But what did I care about the 70's star trek? Nothing. I listened to them, but I had no idea what the hell was going on. Immediately this is really sounding like something off Copper Blue from Mr Bob Mould, not exactly the same deep growl of endless vocal harmony layers, but close. It's fuzzed out guitars, and I think the melody is what's so Bob...and the line about 'Pandora's box'. The stops and starts, underlying acoustic, it's sparkly, crystal clear production is definitely in the same ballpark. What happens when you have a self titled song about the band? Is it a song about the band? How you started, the members, what you're going to sing about on upcoming albums?...I started thinking about how genius this idea could be...like Art Brut's 'We formed a band'. You don't save a princess in this game / all the keys that I'll never find / my hearts at 999. Das Black Milk is a pretty awesome name, and when I saw there were drum machines involved, I thought it might be right up my alley. There are a couple tracks here, starting with 'Art in a Blender' lots of drum machine, I like the verse melody, it's pretty catchy, the vocals are loose, not taking themselves too seriously, repeating the title of the song. 'Wanna be King' the second track kind of has a Peter Murphy sound...or JAMC, it's the nineties, we're serious about sounding really tough...drum machine cramps. Lots of clean production and two very different glasses of Das Milk. Extra points for this being on randomly colored vinyl...this one is kind of a grey/purple/white swirl. 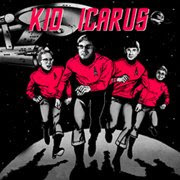 Kid Icarus / Das Black Milk split 7"
Summersteps' own Kid Icarus have teamed up w/ local misanthropes Das Black Milk to produce two new exclusive tracks in a special limited vinyl presentation (on randomly mixed colored wax). The Kid checks in w/ a studio upgrade of one of their earliest & most enduring tracks while the Das Black Milk boys rail against the banality of small town existence, crank up the drum machines and get real gone.